Each year, the Kresge Eminent Artist Award recognizes a metropolitan Detroit artist whose work and career exemplify sustained, outstanding achievement and a commitment to sharing that work within the local community. Eminence was apparent when it came to the recipient, Marcus Belgrave (1936 – 2015). This internationally-recognized trumpeter, who long ago chose Detroit as his home, is an icon to musicians and lovers of jazz. His tireless work over more than five decades, amazing technical abilities, and the joy and spontaneity with which he created distinguished him worldwide as an admired and respected jazz master. 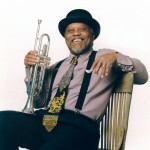 By spreading the language of jazz to generations of students, he remained a beloved mentor to young musicians, many of whom have gone on to become great artists themselves. It is this kind of energy, dedication and virtuosity that the award applauds, and Kresge Arts in Detroit is honored to have named Marcus Belgrave as its second Eminent Artist. Nominations for the award in 2009 were made by the Kresge Arts in Detroit Advisory Council, a volunteer group of leaders in the metropolitan Detroit cultural community who provided external oversight to the program. The award recipient was selected by an independent panel of five influential members of Detroit’s artistic community: Ian Ding, percussionist and founding member of New Music Detroit; Aku Kadogo, Wayne State University faculty member and director of the Black Theatre Program; Anne Parsons, president of the Detroit Symphony Orchestra; Lynn Crawford, writer and editor of the MOCAD Journal; and poet and educator, George Tysh. Kresge Arts in Detroit is grateful to the panel for sharing their expertise and mining the sea of Detroit’s talented cultural producers to select such a worthy candidate as Belgrave. The Kresge Foundation established Kresge Arts in Detroit to support and encourage the artists who enrich our lives and community. Marcus Belgrave has enlightened and enriched our lives for generations, and by conferring this award, we thank him.